Home / QuiBids resolves its millionth Customer Support ticket with Zendesk! QuiBids resolves its millionth Customer Support ticket with Zendesk! You read that correctly: one million tickets. That’s how many we’ve resolved since the dawn of QuiBids time, way back in 2009. Zendesk has walked with us every step of the way as our help desk software provider (other clients include the Denver Broncos, Dropbox, 20th Century Fox, and Groupon), supplying our Customer Support team with the tools they need to manage the average 700 tickets they receive each day (you’ll soon see that that number increases dramatically around this time of year). But what is a “Customer Support ticket” exactly? And what does it mean for it to be resolved? Put short, a ticket is created whenever QuiBids Customer Support receives an email from a customer who needs help with some issue, usually as simple as “How does the Bid-O-Matic work?” or “Where are the bids I should’ve gotten for referring my friend to join?” Sometimes the issue is a little more complicated —like if we experience unexpected trouble on the back end of the site, for instance— and it may take longer to resolve the ticket, but you’ll soon learn that that’s a rarity. Zendesk recently published a case study about us —they also sent our Customer Support managers some awesome Zendesk T-shirts, as you can see in the photo above!— which explains how vital a speedy response time is to our business. The study also breaks down some big-time numbers to help explain just what “one million tickets” means, exactly. I also consulted Customer Support director Josh Walker to confirm some of these and add some more statistics of his to show you guys exactly what to expect from QuiBids Customer Support! 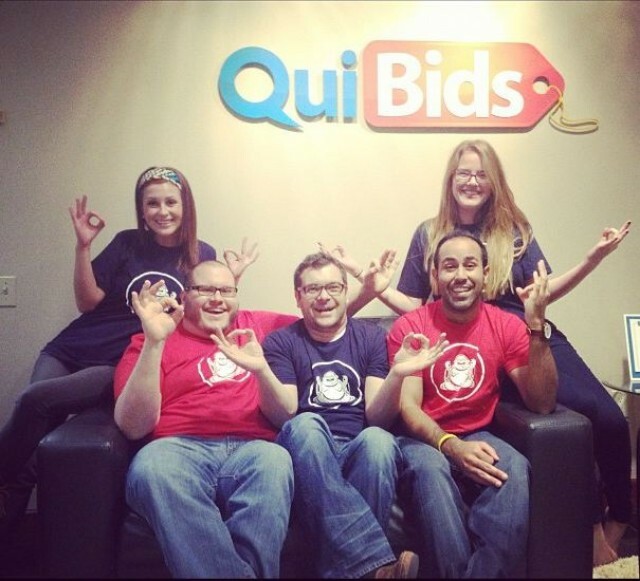 @quibids We are SO happy to hear that you hit such an awesome milestone using Zendesk! Congrats on supporting your customers, you guys rock! This is —on average— how often QuiBids Customer Support receives a ticket, all day, every day, 365 days a year. This is how much time Zendesk’s tailored software saves our Customer Support team every single day. This is the percent of QuiBids Customer Support tickets that are resolved at first touch. In other words, nine out of ten customer issues with QuiBids are resolved with a single email. This is our average first response time. It’s how long it takes —on average— for a QuiBids Customer Support employee to first respond to a customer’s issue. That’s the benchmark average first response time for the retail industry, about twelve hours longer than QuiBids’ average first response time. This is the average increase in tickets between a typical business day and the Thanksgiving-New Year’s holiday season. So as you can see, there’s never a dull moment in the QuiBids Customer Support department. And thanks to Zendesk it never gets unmanageable either! Contact QuiBids’ Customer Support team here. And as always, happy bidding! Need help? Try QuiBids Support.